President Benigno Aquino III will deliver the keynote speech at the Joint Foreign Chambers’ (JFC) first anniversary Arangkada Philippines Forum on January 26, 2012 at the Grand Ballroom, Marriott Hotel Manila. DTI Secretary Gregory Domingo will deliver the opening remarks on “The Role of Foreign Investment in Philippine Economic Growth.” Former Finance Secretary Roberto de Ocampo and National Competitiveness Council Private Sector Co-Chairman Guillermo Luz will discuss key reforms needed to grow and strategies to improve Philippine ranking in global surveys, respectively. Panels of experts will identify priority policies and programs to propel the growth of the Seven Big Winner Sectors: Agribusiness, Business Process Outsourcing, Creative Industries, Infrastructure, Manufacturing and Logistics, Mining, and Tourism, Medical Travel, and Retirement. The 130-page First Anniversary Assessment which contains select charts and figures from Arangkada 2010 and the updated status of the 471 recommendations one year after publication will be distributed at the Forum. The first copy of the JFC advocacy paper Arangkada was given to President Aquino on December 1, 2010. The Forum is co-sponsored by DTI in partnership with BOI and other Philippine business groups and donor agencies. Some 500 participants, including investors, diplomats, government officials, industry experts, and media are expected to attend. 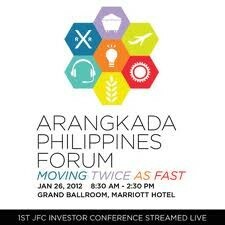 The Forum is the first JFC investor conference streamed live. Audiences will be able to watch the Forum in real time through the Arangkada Philippines website, www.arangkadaphilippines.com, and participate by sending their questions via Facebook, Twitter, and email to be answered live or afterwards.